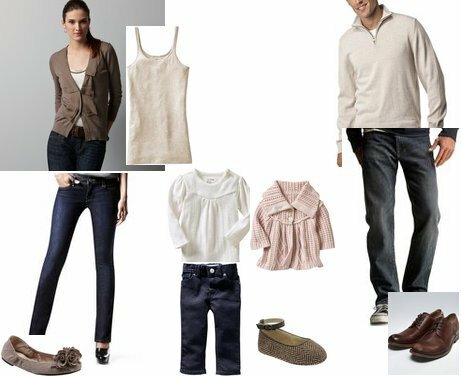 Since it's getting to be the time of year when people start thinking about family photos, I thought I'd put together a few outfits to answer the tricky "what should we wear?" question. The main idea when picking your clothing is to make sure you put together items that are complementary but not matchy-matchy. Show your personality a little! I based this first look off of the adorable blush colored sweater that I spotted at Gap Kids for a little girl. From there I just added warm neutrals with a bit of interesting detail. For this second look, I based the outfits around the little boy's fair isle sweater. It has oatmeal, orange, and light blue in the pattern, so it was easy to pull a few colors out for the mom & dad's outfits. Love the look of classic black and white but want to spice it up a little? Here are two versions, one with a little girl's outfit and one with a little boy's (I just love the plaid shirt and tie...so cute!!). It's ok to mix patterns, as long as everything is in the same color family. Whatever you end up wearing for your photos, the clothing should make you feel good as well as look good! 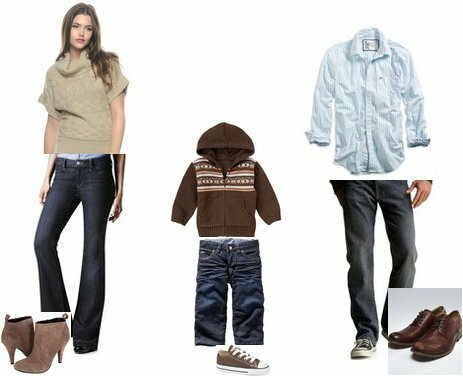 My advice is to find one item (a sweater for your little boy, a dress for your little girl) and then base the rest of the outfits around it like I did above. And remember, your outfits should complement each other but not necessarily match (this is key - do you really want another family photo where everyone's in white button downs and khaki pants?). the fourth option is so GOOD! Thank you Grace! I think that one is my favorite too.